Finally after series of crises that marred the Congress of the All Progressives Congress (APC) in Imo State, the party, on Monday, elected a new state Chairman, Daniel Nwafor. 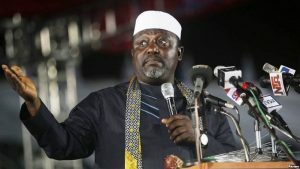 Executive Governor of Imo state Rochas Okorocha, however, boasted that the election was a legitimate exercise, unlike the previous one. Ojo Adesayo, the Chairman of the Congress committee, in his speech after the election which took place at a well-attended state Congress held at the IMO International Convention Centre (IICC), Owerri, expressed satisfaction over the conduct of the exercise, observing that it was done according to the rules of the party. The Chairman of the committee noted that members of the committee worked tirelessly to ensure a successful and hitch-free, election. He urged the newly-elected members to work in harmony and bring back all aggrieved members of the party. Ojo also tasked the State Working Committee to ensure that they reposition the party ahead of the 2019 general election, to enable the party emerge victorious in the 2019 elections. The newly-elected chairman, in his speech shortly after his inauguration, pledged to reconcile aggrieved members, even as he vowed to carry everyone along. He stated that the State Working Committee would swing into action by constituting a reconciliation committee that would reach out to all aggrieved members to settle their differences. Nwafor also assured that the new state leadership under him will deliver the party 100 percent in the 2019 election, both at the state and national levels. “We are going to embark on the aggressive membership drive to further strengthen our party and position it for victory, we assure Mr. President that we will deliver, nothing shall stop our victory. “We are not going to leave anyone behind, we will run an inclusive administration that will give every member equal opportunities. We are also going to quickly put machinery in motion to reach out to all aggrieved members of our great party so that together, we can make our party greater. The leader of the Independent National Electoral Commission (INEC), monitoring team in the state, Sir Victor Nwokeabia, who monitored the election in his speech expressed satisfaction with the conduct, affirming that the exercise met with the provisions of the constitution of the party. Earlier, Okorocha, who participated in the exercise, described it as a legitimate exercise, unlike the previous one. He congratulated the elected party officials and charged them to work hard and conduct the affairs of the party in line with the constitution. The 27 elected local government chairmen were immediately sworn-in by the state chairman. The Federal High Court sitting in Owerri had ordered for fresh congress in the state after it nullified the one earlier conducted by a faction of the party for flouting the provisions of the constitution of the party. The party consequently rescheduled the ward, local government and state congresses in compliance with the court judgment.